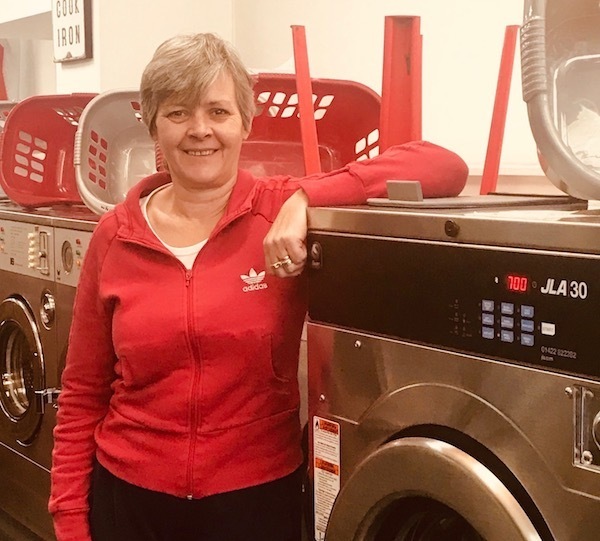 The launderette has been helping to look after Hackney Winter Night Shelter’s laundry for over five years. Sue and Chanel have been working at the launderette on Upper Clapton Road, Hackney, for a combined 27 years. It’s a sociable place that people frequent for more than just a hot wash. “They say you can come here for problems, nursery, advice, gossip”, says Sue. It coincided with one of the most brutal winters that Britain has witnessed in decades, which saw many of its homeless face unprecedented freezing conditions. While visiting the laundrette during this time, guests say they found more than just their own independence. They found a welcoming environment where they were offered hot drinks, there was someone to talk to and, crucially, it was a place where they didn’t feel judged. As one guest says: “When we came here we were homeless and at times you can feel like maybe you smell, maybe you look homeless. But these guys were really sweet and used to offer me a biscuit and hot chocolate”. “I used to come in here take my clothes off and sit in my shorts as I only had one pair of clothes at the time, and they wouldn’t judge me or anything what else can you ask for. The whole no judgement was a really big thing”, they said. Sue and Chanel say that this interaction with the shelter’s guests challenged their perception of what a homeless person looked like. When the weather got particularly bad, Sue and Chanel say a few of the guests came in and sit with them for most of the day. “Being homeless completely messes with your concept of time”, says one guest. You know you have to be somewhere at 7.30 p.m. and you have to be out by 8 a.m. and then the whole time in between you’re just looking for stuff to do”. “I think it’s just someone to talk to”, says Chanel. “They’re walking around the streets all day but there’s no one to talk to”. The guests say that feeling and smelling clean after using the launderette gave their self esteem a boost. As Sue and Chanel’s bond with the guests grew, they’d find small ways to help them out, like store bags of clothes for them or offer them clothes that had been left behind at the laundrette over the years. Both Sue and Chanel say that their interaction with guests of the shelter touched them, particularly with some of the older guests that they met or those who were suffering from mental health issues. Having the guests come in personally to wash their clothes made Chanel feel more aware of the homeless crisis in Hackney. “Before the night shelter would just come in and collect the sheets, it was sort of out of sight out of mind. But when you see the guests on a weekly basis it makes you sit and appreciate what you’ve actually got”, she said. Having built a relationship with many of the guests, they encourage them to drop in and let them know they’re OK once they’ve moved on from the shelter. “I say to them don’t forget us now you’ve been housed. Come and have a cup of tea” Chanel says, insisting that this is just how they would treat all of their customers. “There’s no special treatment. We’ve always been the same, had the same policies, it’s just customer service, it’s a launderette at the end of the day”.